News – Every Day Is a Holiday at the Montclair Film Festival! 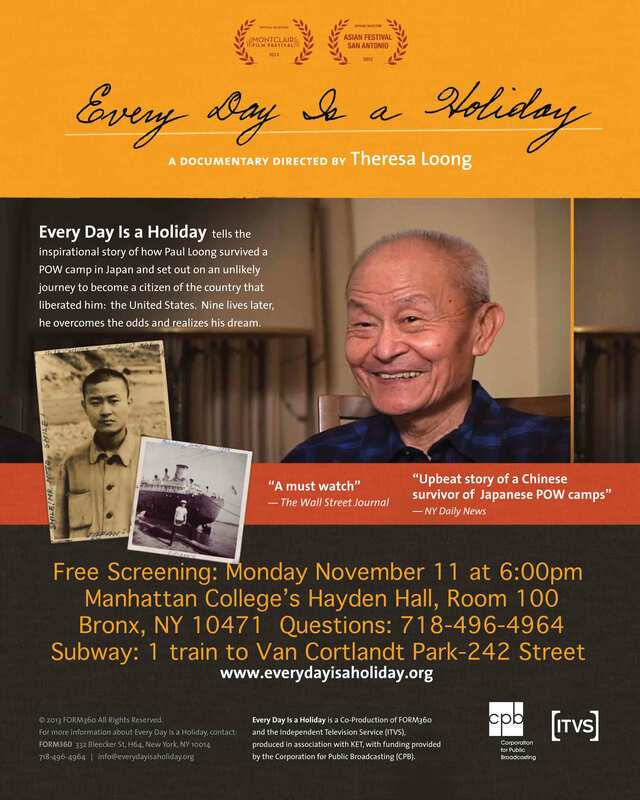 Every Day Is a Holiday tells the inspirational story of how my dad, Paul Loong, survived a POW camp in Japan and set out on an unlikely journey to become a citizen of the country that liberated him: the United States. Every Day Is a Holiday is heading to the Montclair Film Festival! Every Day Is a Holiday is playing on over 60 public television stations – on the World Compass channels – Over 60 stations, Friday, May 3 at 6pm and 9pm, Sunday May 5 at 7pm and Monday at 11am. See the map below for a station near you. For current showtimes in your area, please type in your zip code. Heading to Houston and Austin March 15-17! I will be screening Every Day Is a Holiday and speaking in Houston to this great group: USS HOUSTON (CA-30) Survivors Association and the Next Generations. On April 17 at 6pm, I will be screening Every Day Is a Holiday at the Flushing Public Library in Queens, NY, as part of Immigrant Heritage Week. Every Day Is a Holiday streamed online as part of a Social Screening series, on Sunday, June 17 at 3pm EST. Read the chat transcript with Dr. Loong and special guests, including ex-POW Eddie Fung and Professor Judy Yung. Many thanks to Steve Goldbloom at ITVS, Eddie Fung, Judy Yung, Craig Cornwell and Karin Pekarchik at KET. -World Compass channels – Over 60 stations, Friday, May 11 at 5am, 11am, and 6pm. While growing up in suburban New Jersey, Chinese-American filmmaker Theresa Loong knew little about her father’s past. Then, one day she discovered his secret diary, written when he was a teenager and POW in a Japanese work camp during World War II. In it, he vowed to make “every day a holiday” if he ever survived. Told through her eyes, EVERY DAY IS A HOLIDAY tells the painful but life-affirming story of her father’s unlikely journey, from Chinese Malay teenager and Japanese POW, to merchant seaman, Veterans Affairs doctor and naturalized citizen of the country that liberated him: the United States. Using intimate conversations, rare archival footage and his wartime diary, the film traces how, through sheer strength of will, Paul Loong overcomes the horrors of war and obstacles as an immigrant, making “every day a holiday”. Happy to discuss crowdfunding with the cARTwheel Initiative‘s founder Ashok Sinha, Natalia Duong (artistic director, Project Agent Orange), Joyce Manalo (founding curator, FABnyc ArtUp and ArtForward) and awesome moderator Matthew Deleget (founder, Minus Space). Some takeaways: Think about emailing small groups of ten people and putting everyone’s email address in the To: field instead of blind copying to help with positive peer pressure about your campaign. Utilize Hoot Suite or other social media management tool (any suggestions?). Remember to use the telephone and reach out to your funders. Go to The Foundation Center and utilize their great resources. I’m so thrilled to have the support of ITVS and my station partner, Kentucky Educational Television (KET). Stay tuned for local and national television broadcast dates! As you may know, this adventure has been going on for a number of years. I am in the “home stretch” and I am very grateful for your support and generosity. Join our roster of donors!